The shore newbie is out again this morning, for the the fourth consecutive morning shore trip. Today, I visited Kusu Island. Kusu Island has amazing reef surrounding the island. Just by visiting the big lagoon, you will be amazed by the number of corals and many other animals growing there with the city's skyscrapers and the Singapore flyer in view in the distant. You can see CDB in the far distant. When we were walking towards the shore, Ria warned Jocelyn and I about the big stonefish commonly spotted in the reef. Furthermore, the water near the sea wall were still murky as the tide recedes. With the stonefish in my mind, I decided that I'll wait a while more before stepping into the unknown depth of murky water. Luckily Mr Stonefish decided to go on a holiday and we didn't get to meet him. I started checking out the sea wall first. 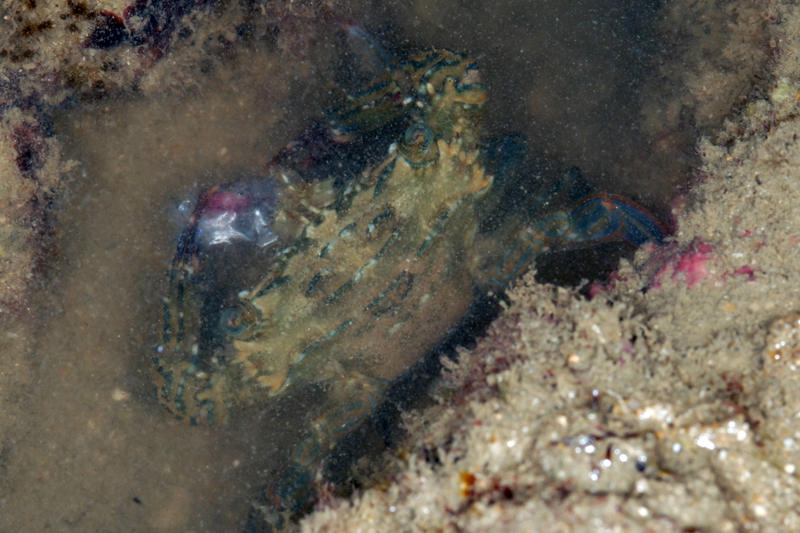 There were many purple climber crabs (Metopograpsus sp.) out feeding on the rock surface. This crab is carrying eggs. There were also many sea slaters (Ligia sp.) moving around on the rocks. There were many different types of both hard and soft corals and some sponges to be found on this reef: Jigsaw maze favid corals (Family Faviidae), Branching pore corals (Porites sp. 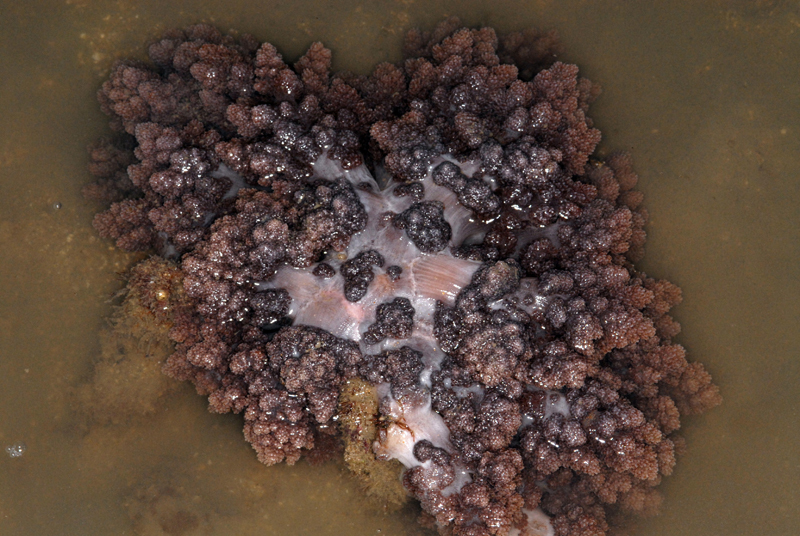 ), Smooth branched montipora coral (Acropora sp. 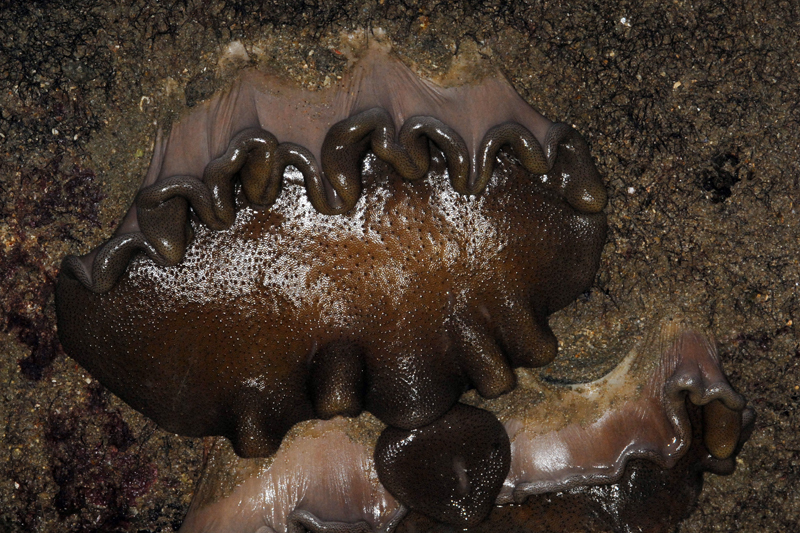 ), Omelette leathery coral (Sacrophyton sp.) and others. I am very bad at identifying corals. 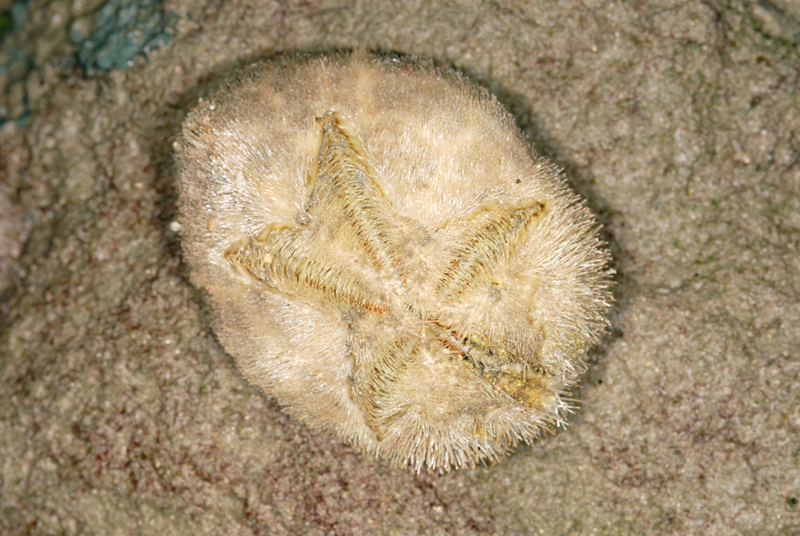 Interesting layout of branching corals with a Faviidae. There were a few colony of the Asparagus flowery soft coral (Family Nephtheidae). Being out of water, the asparagus flowery soft coral looked like a fallen tree in the sea. I tired lifting the 'stem' of the coral only to be surprised by the heaviness of it. It felt like lifting a very thick piece of meat. I was not able to find any commensals on the soft coral. I was astonished by the vast number of the Giant carpet anemone (Stichodactyla gigantea) and the Magnificent anemone (Heteractis magnifica) found everywhere. 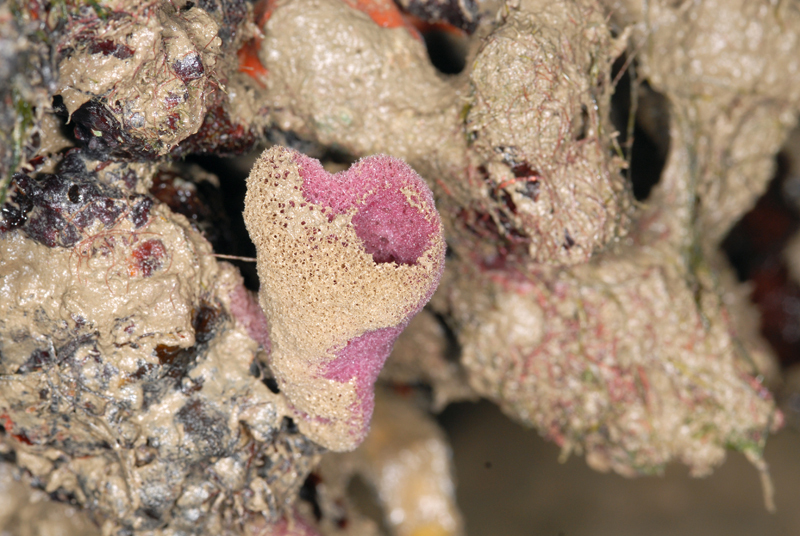 They were found on big rocks, along the sea wall, among corals, everywhere. However my long macro lens wasn't able to capture an overview of the anemone cluster and I was too lazy to summon my compact camera from my bag. (This is a stupid excuse I know.) So I blame myself for not getting the photos for this post. 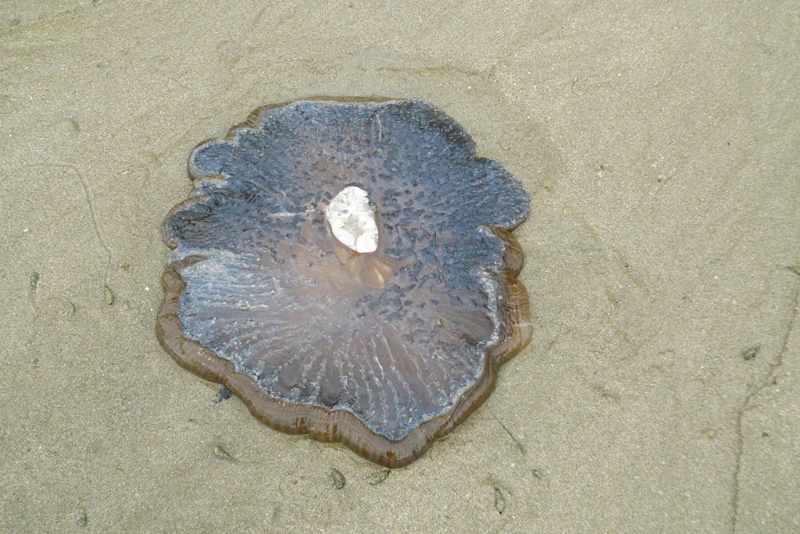 Later in the trip, I found a giant carpet anemone on a corner on the high shore. It was the only anemone in that area, very far away from the rest of the anemones. I hope that this fellow does not get killed by visitors to this island during the high tide as it is very near the surf break zone. Lonely giant carpet anemone found on high shore. With so many big anemones around, the little ones tend to be forgottened. Actually they are very easy to spot with their dark coloured tentacles. I wasn't able to find information about this small anemones. 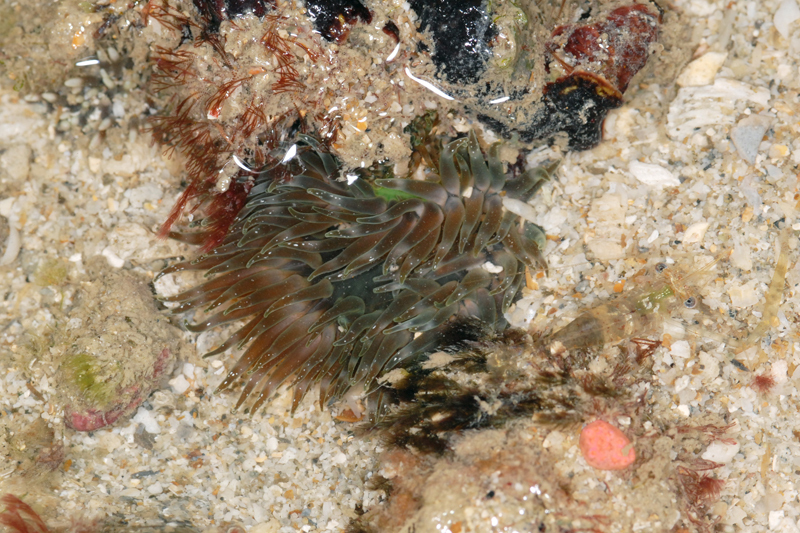 From a few images that I took, the anemone has alternating dark and light bands on its tentacles and a thin neon green band on its body column. 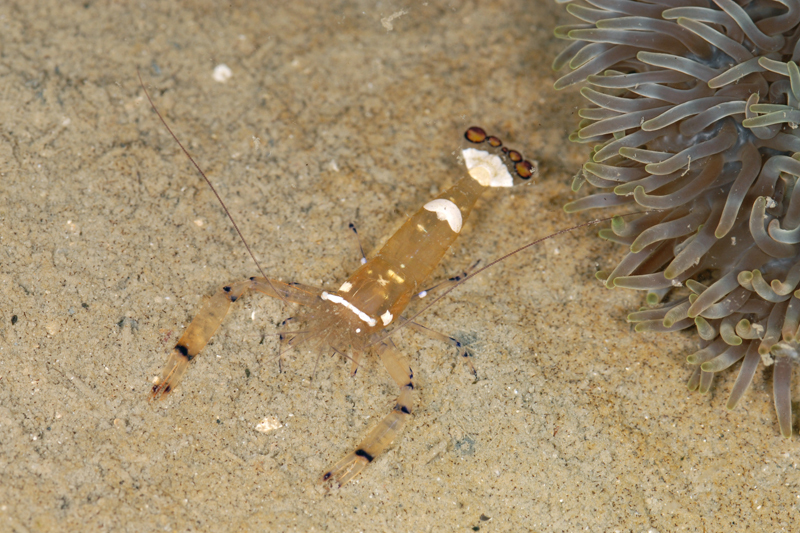 As from the picture below, the anemone is slightly bigger than the shrimp next to it. Unknown small anemone with a shrimp on the right. A visible band of neon green on the body column? There are many different kinds of shrimps to be seen. I found Five-spot anemone shrimp (Periclimenes brevicarpalis) couple on a shallow pool next to a Giant carpet anemone. 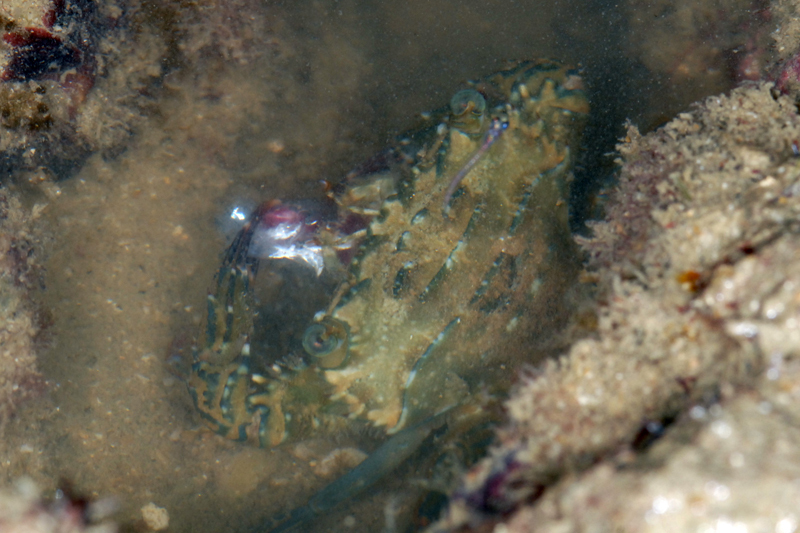 They were locked out of the anemone due to the low tide. 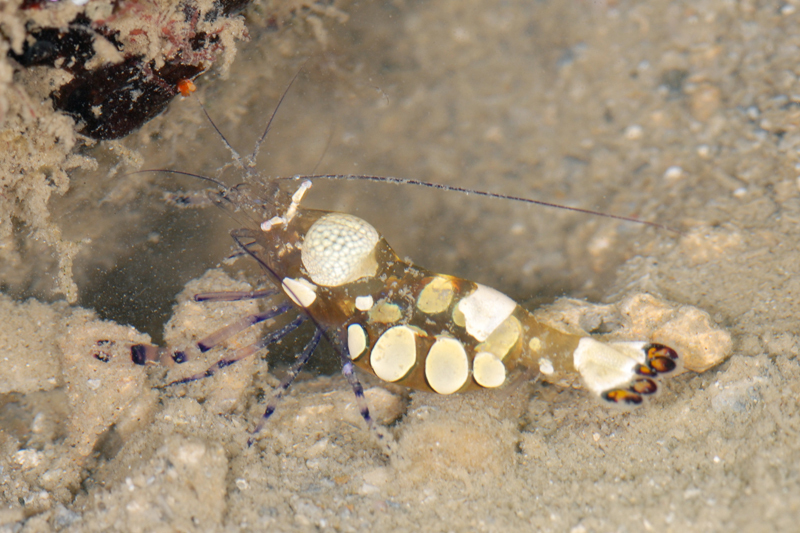 The female shrimp is often larger and more brightly marked as compared to the male shrimp. While observing the female shrimp, it was "rolling" from side to side to show me the various view of its body. The couple seems to be alright with me disturbing them for a short while. 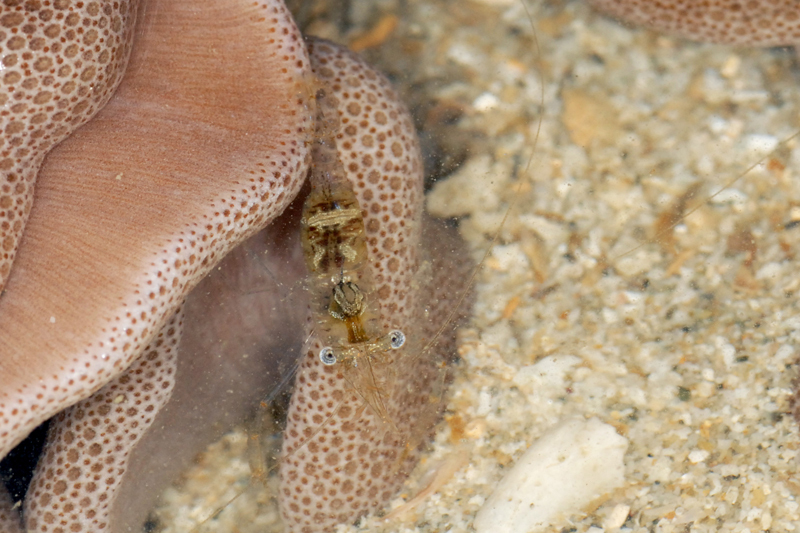 Female five-spot anemone shrimp next to a burrow. I saw another type shrimp on a coral. I am unable to identify this shrimp. 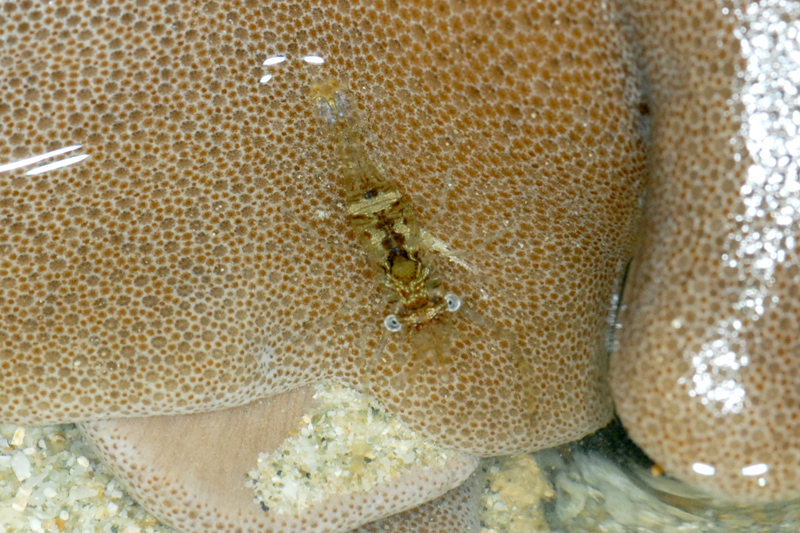 There were other shrimps resting on other corals. Not sure what kind of shrimp they are. Jocelyne found a Saron shrimp (Family Hippolytidae). Hurray! We had to check the shrimp to make sure that it is not carrying any eggs. The Saron shrimp Jocelyne found passed! This means shrimp specialists will have another Saron shrimp specimen to study from. 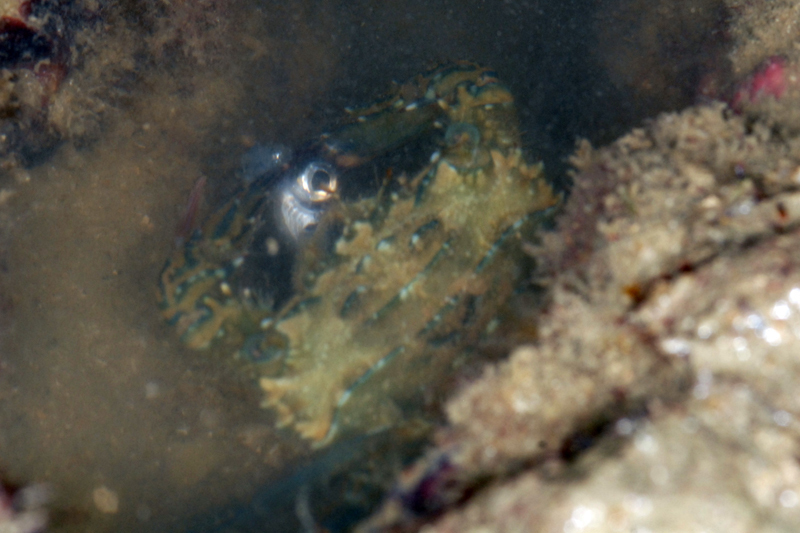 How can we forget about the crabs living in the reefs? There were a lot of actions from the crabs out in the reef. 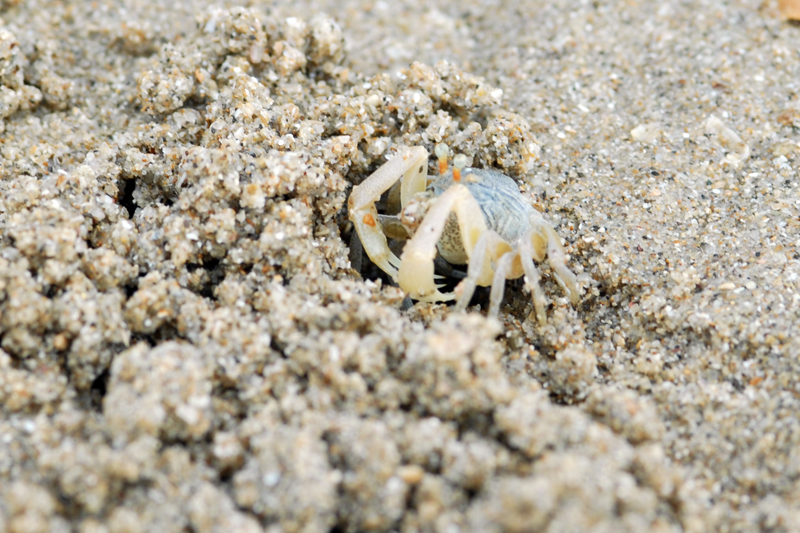 A small fish was leaping around on the surface of a shallow pool and it made a crab angry. I witnessed how the small fish happened to leap close to the crab and the crab just grabbed the fish with its pincers and ate it. Here's the crab enjoying its catch in sequence. 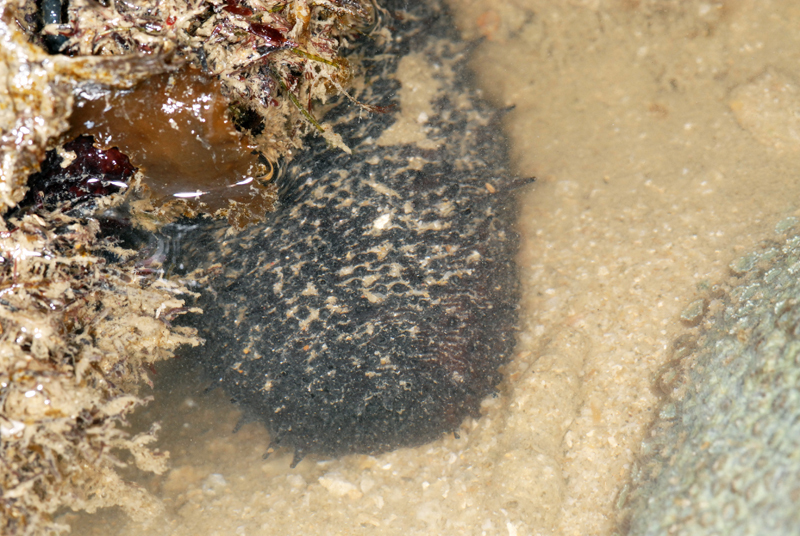 I saw a sea cucumber hiding under rocks with part of its body revealed. It looks like the Black long sea cucumber (Holothuria leucospilota). When I touched it, it retracted very quickly. Ria saw this Oval maretia heart urchin (Maretia ovata) and it looked like it had just recently as the spines are still intact. 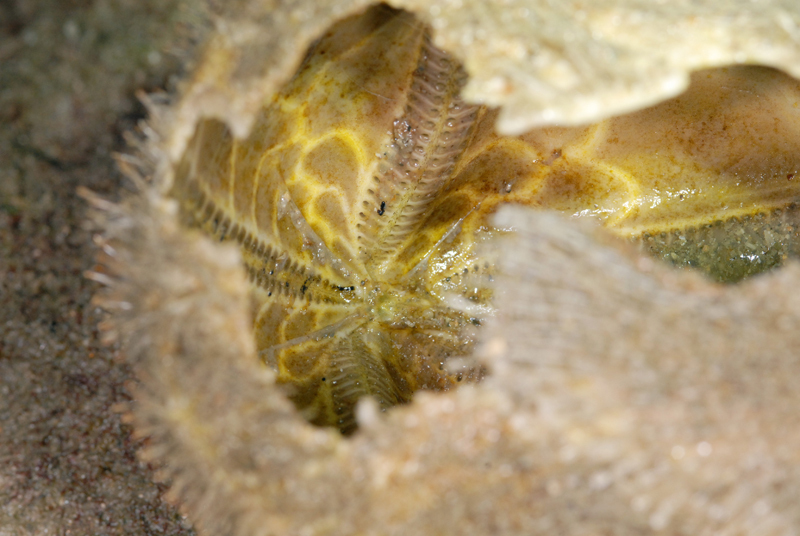 On the underside of the heart urchin, there was a large hole. 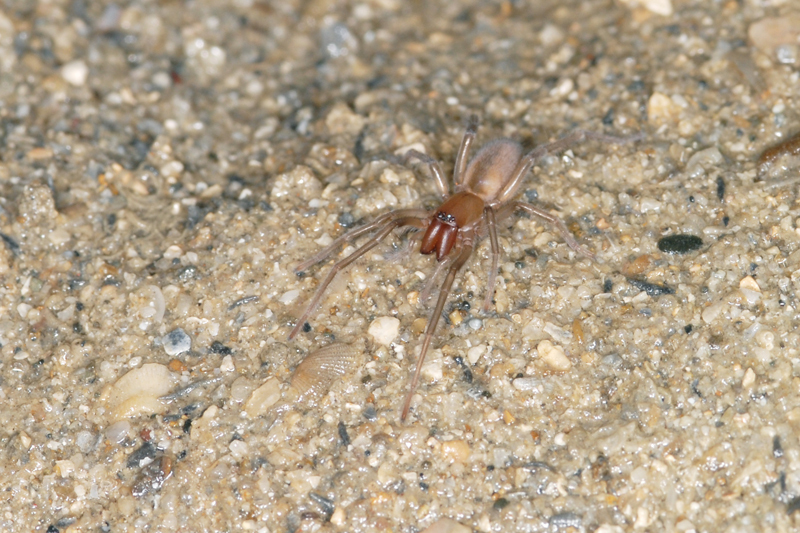 On mid shore, a Marine spider (Desis martensi) was nice enough to stay still for me to take pictures. I saw a Hairy crab (Family Pilumnidae). The Hairy crab has a nickname called "teddy-bear" because of the fluffiness of the hair when in water. I tried to coax this little fellow to come out but it just didn't want to. 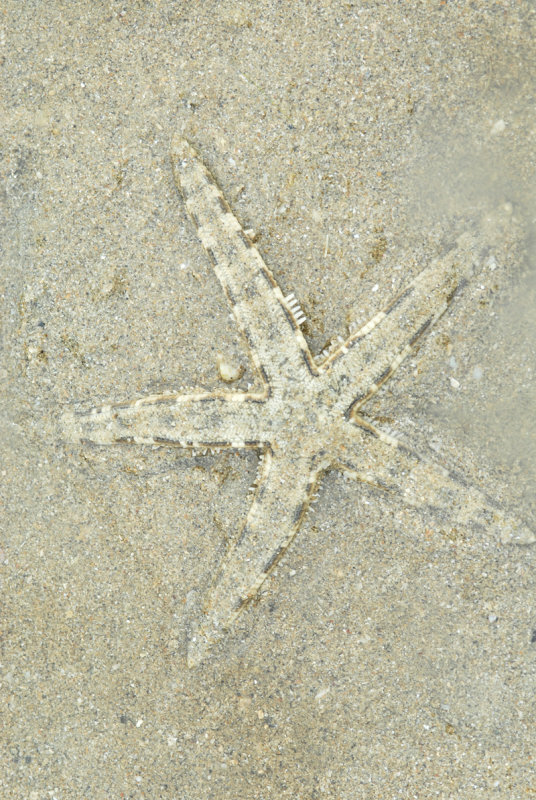 Higher up the shore, I only managed to find two Common sea stars (Archaster typicus). I found them from the star shape on the sand when they burrow. The first one was halfway through its burrowing when I disturbed it. I couldn't see the other star physically but the star shape in the sand told me it is there. On the high shore, there were plenty little sand bubbles left outside each hole. 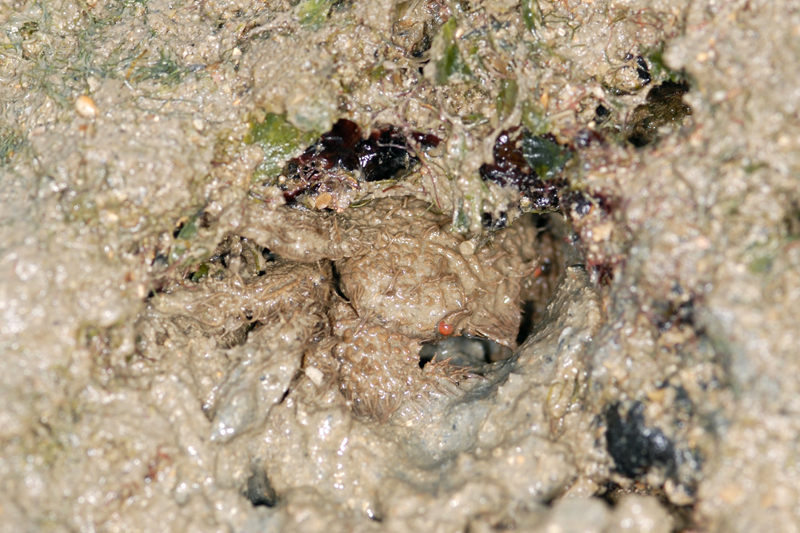 The small holes housed the Sand bubbler crabs (Scopimera sp.) 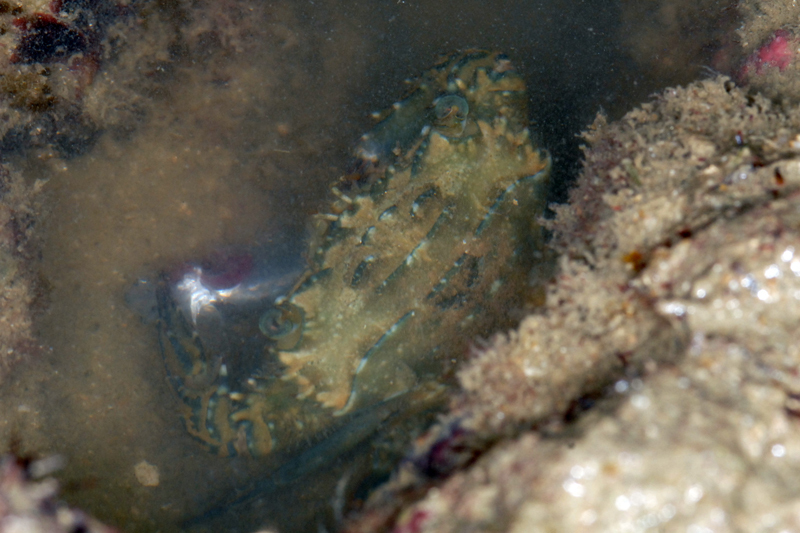 while the bigger holes housed the Soldier crab (Dotilla sp.). It was though taking pictures of these little fellows as they are very sensitive to motion. So I had to stay very still and waiting for them to come out. However only the crab nearby came out while at the hole I was aiming at, the crab refuses to come out. 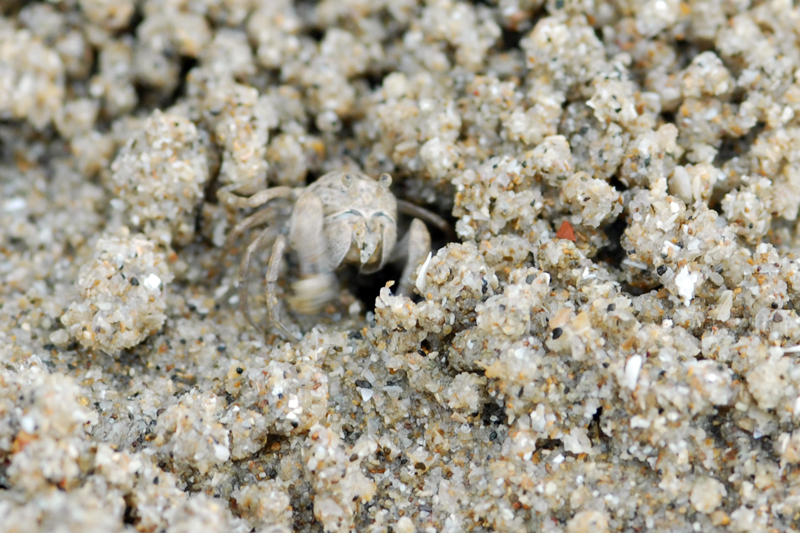 Sand bubbler crab doing the sand bubble sweep. Soldier crab forming little balls of sand too. They seemed to be playing the tiring game with us. They will make you squat until your legs are tired and then they appear, causing you to take shaky images of them. Eventually I resorted to kneeing on the sand in a prone position. Jocelyne caught a picture of me in prone position. 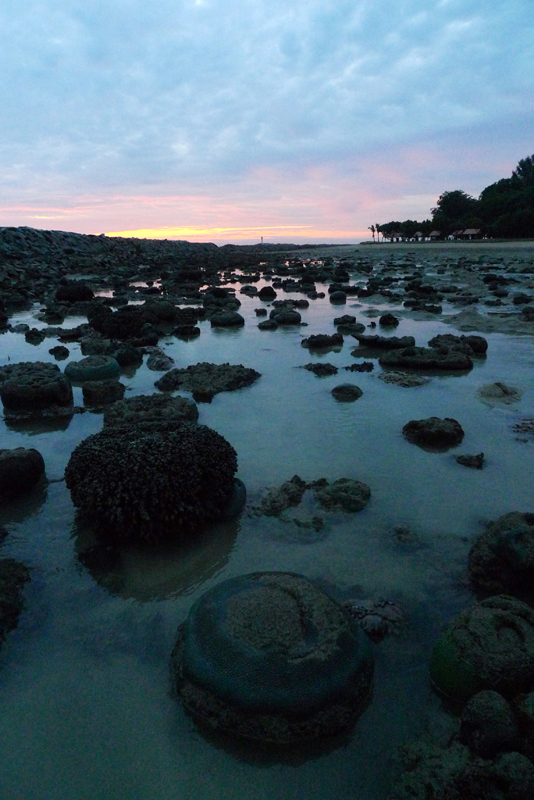 With that, let me end off this post with a sunrise image at Kusu Island with the reef. 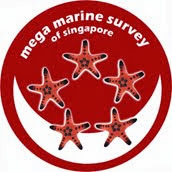 Tomorrow the team is going to take up a new challenge of checking out the coral reef at Tanah Merah. It's not as simple as just walking down to the reef. I won't be joining them. Hope they have lots of fun. Check out Ria's post about Kusu Island here. 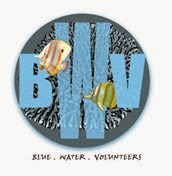 On Saturday, I'm joining the International Coastal Cleanup Singapore team for a year round cleanup session at Pasir Ris Site 6. I covered this site last September with my students as part of the yearly coastal cleanup program. Hopefully I can get some shots of the cleanup this Saturday.